Free Attic Mold Inspection | Our trained Aerobiologist(s) can quickly identify visible mold or make clarification of “mold-like” substances. Free Attic Mold Inspection | Our trained Aerobiologist(s) can quickly identify visible mold or make clarification of “mold-like” substances. Then recommendations are provided to correct the problems providing both the buyer and seller peace of mind. What is the solution? Hire competent, trained, and experienced specialists – us! 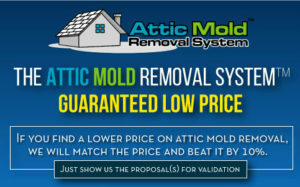 Mold Level Corporation, creators of the Attic Mold Removal System™.